Global Transformations is managed by a small number of scholars amongst the major experts on globalization issues and published online by the journal Polity. 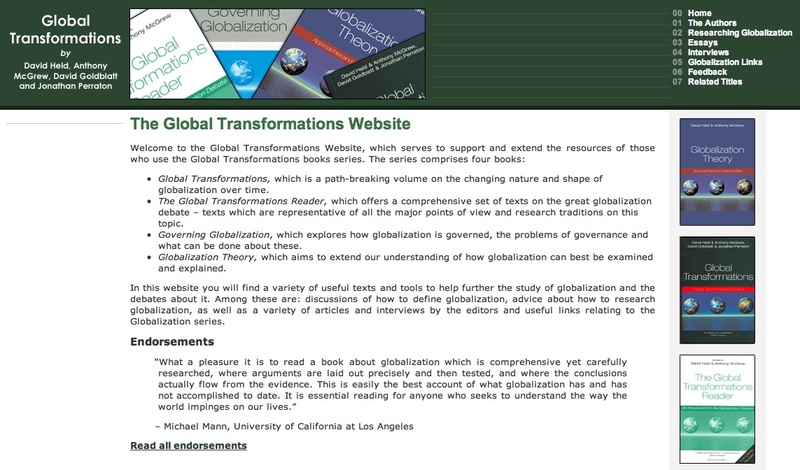 Partly an extensions to the Global Transformations books series, this website hosts information and annotated material on globalization and its impact on democracy, including research reports and papers, interviews, books descriptions, sample readings, entries, reviews, interviews and debates. Moreover, useful indicators about the several dimensions of global change are provided for students and scholars willing to conduct research on this topic. In addition users can find an executive summary of the key features of globalization and more information on some textbooks and other publications, mainly by the same scholars. Material is downloadable in various formats completely for free by all users. Linking features are very well developed, listing plenty of pertinent external web-resources. Users can only browse through categories and pages (no search option is provided), and updating rate is quite irregular. Beside its very basic design, a simple but information-rich website on a single, important issue.